In eight months, the Indian Air Force begins receiving its first of 36 Rafale jets, armed with the the world’s longest range air-to-air missile, the Meteor. Highly impressed with the capabilities of the European weapon system, the Indian Air Force had in early 2018 proposed a separate effort to arm some of its other aircraft with the missile. 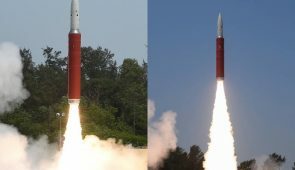 But steadily receding hopes of this possibility over the last year will likely officially die this week when the missile’s maker MBDA meets with the LCA’s maker Hindustan Aeronautics Ltd (HAL) to finally say no, the Meteor can’t be slung into an aircraft if the radar on that aircraft is of Israeli make. Fleetwide weapon commonality is something the Indian Air Force has been actively scouting recently. Livefist reported last week that the IAF will deploy the European ASRAAM on its Russian-origin Su-30 MKI jets this year, with a proposal to see a roll out on other jet types too. However, arming jets with the infrared guided ASRAAM missile, which doesn’t require complex integration with aircraft sensors, is a far simpler exercise than the active guided Meteor that requires source codes and proprietary software tweaks to work. The Meteor, in other words, cannot be effectively integrated without the express involvement of both the radar maker as well as the builder of the missile. Mr Aroor does not at any time mention our own missile under development which is in the Meteor class (SFDR). He is possibly one of the few remaining people who cannot see a future without being enslaved to the Goras. He along with some IAF folks and some journos want more and more imports. NATO, F-35 is bought by many nato countries and where they are sold they can sell Meteor too as they are allies. UK is one of the developers of the missile too , so obvious it would want to put on aircraft. When it said the radar would not be integrated until 2022 the Israeli radar. It may have been better to have used the cheaper Uttam radar which is going through integration on Tejas right now. This is another “pressure tactic” and a totally “monopolistic” attempt to support the EU Defense industry. Such absurd “requirements” should be ALL the motivation required for the IAF and ELTA to tie up with other DRDO and other Israeli manufacturers to develop a competing system for half the cost and under-cut the Europeans. Even “seed funding” for this by India can get the ball rolling and get the Europeans to change their tune plus Israel would love to capitalize on this opportunity to build a system they would ultimately find immensely useful to maintain air superiority for decades to come in the ME & Africa. This isn’t how European Union wants to spread their business by pressuring the IAF and Government. They want to push all their avionics in IAF fleet. That’s why go for should think over the indigenous and develop in-house technology. Raffle or Thales, they want to do the business with IAF by pressurisation or defaming our own PSUs and DRDOs capability, later they will squeeze money for fleet support.